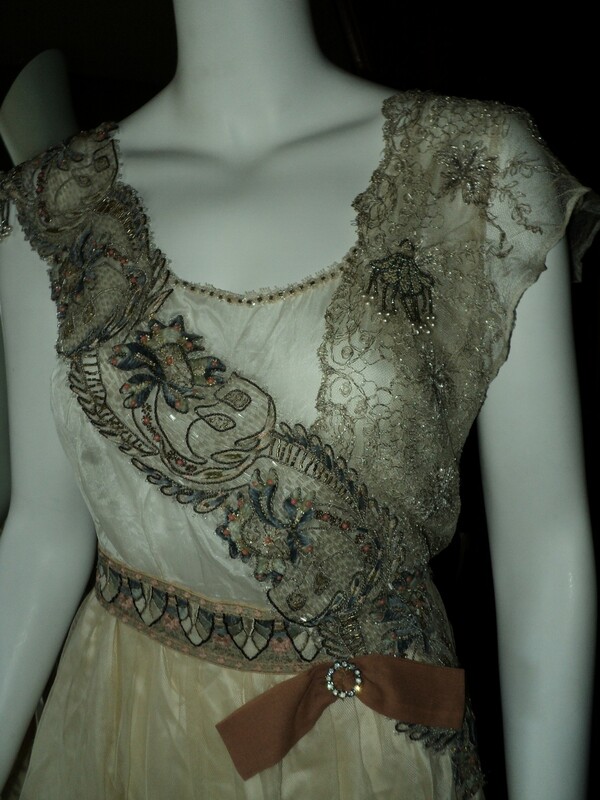 My absolutely favorite fashion era is the Edwardian era. The Edwardian era follows the Victorian period and begins at the death of Queen Victoria and the succession of her son, King Edward VII, corresponding with his reign and encompassing the years of 1901-1919. At times, historians end the Edwardian period with the King’s death in 1910, but generally it is known to extend beyond his death and including the sinking of the RMS Titanic in 1912, the start of World War I in 1914 to the signing of the Treaty of Versailles in 1919. 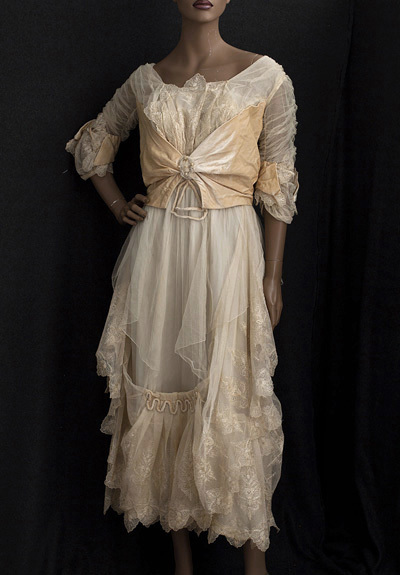 The beginning of Edwardian era fashion still followed along Victorian fashion lines with leg-of-mutton sleeves, high collars, long skirts — all focusing on an hourglass silhouette. 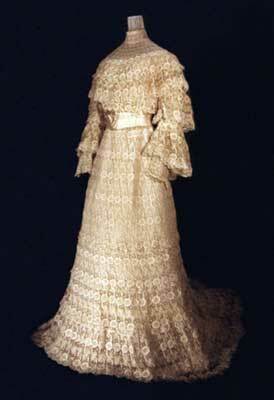 Many gowns featured long trains and an abundance of beautiful fine lace and luxurious fabrics. Women still wore corsets, but wore a “health” corset which gave women an S-curve shape, with a full low chest and curvy hips. 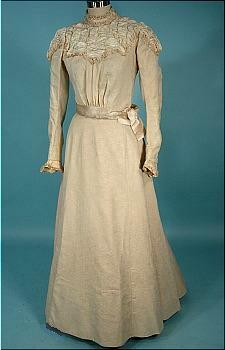 As the Edwardian era progressed, the high necks got lower and the silhouette became simpler and less full. As the years went by, the sleeves became shorter. 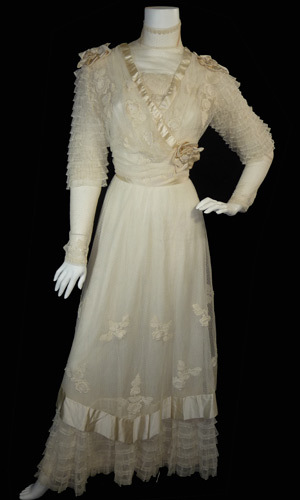 Following is one of my favorite Edwardian wedding gowns, this off-the-shoulder stunner from the Commodore Perry estate and currently for sale at Vintage Textile. 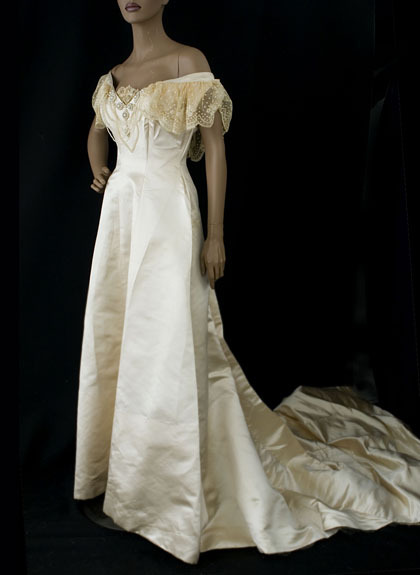 I based the bodice of my own wedding gown on this beautiful dress. 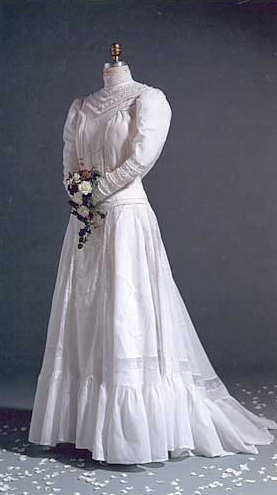 The mid-to-late Edwardian period began featuring robed gowns, either faux or with an overdress and cummerbunds or sashes. 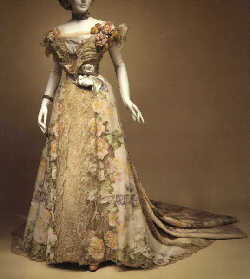 This is where “Titanic Era” fashion begins to form with opulent, embellished gowns that are my absolute favorites. 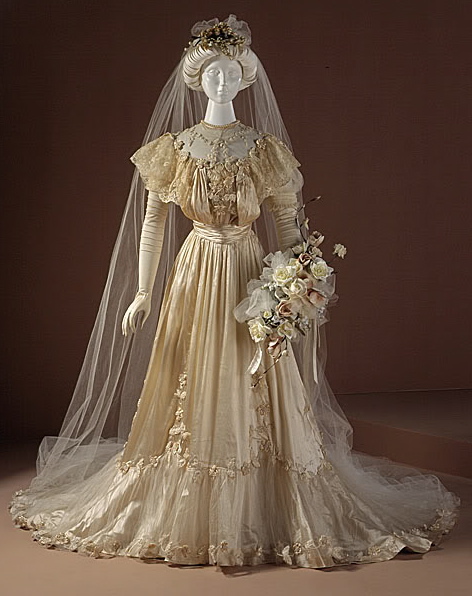 The Edwardian tea dress is a favorite of mine as well and lovely enough to be worn as a wedding gown. 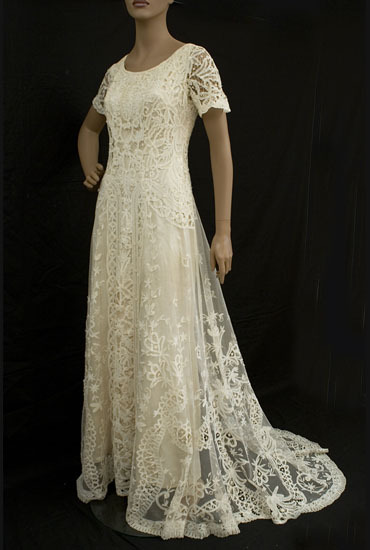 I love the abundance of lace on these gowns paired with the short sleeves and slim silhouette. 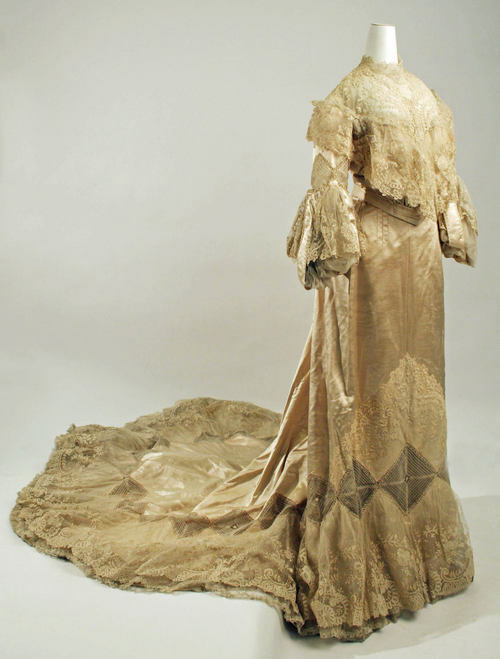 The Late Edwardian period epitomizes the “Gilded Age” with magnificent attention to details with embroidery, beadwork, lace and luscious textiles. As the Edwardian era neared it’s end and the 1920’s came into view, hemlines were shortened and dresses became looser and women began to lose their corsets. 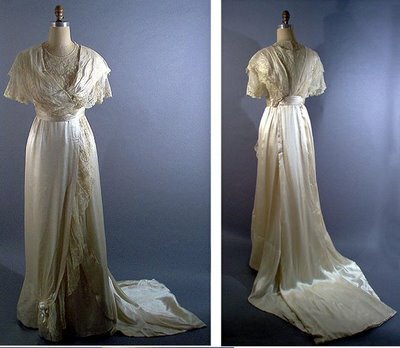 If you’re planning an Edwardian inspired vintage wedding and aren’t lucky enough to posess an heirloom gown, you can either find an original or have one custom made. 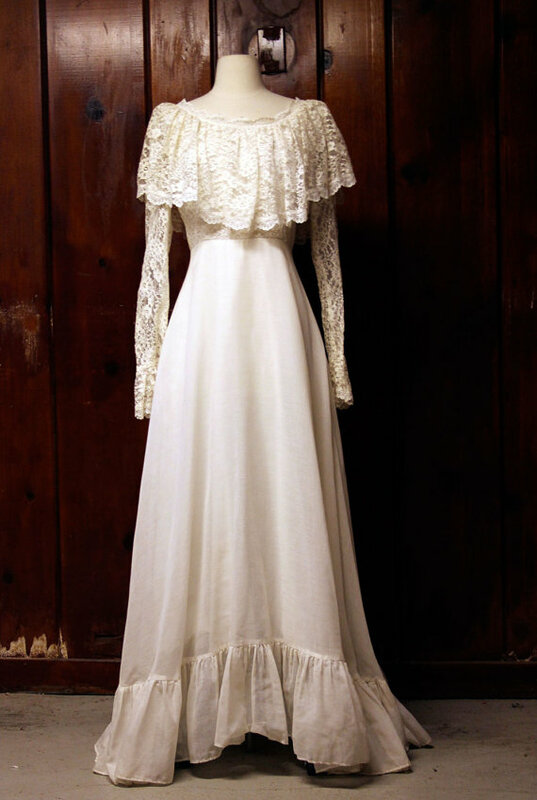 I’ve also found Edwardian gowns on Etsy and eBay, where it can be possible to get one for a good deal. I hear others talk about finding them in thrift stores and consignment shops, but I’ve never seen any in my area (although I continue to look!). 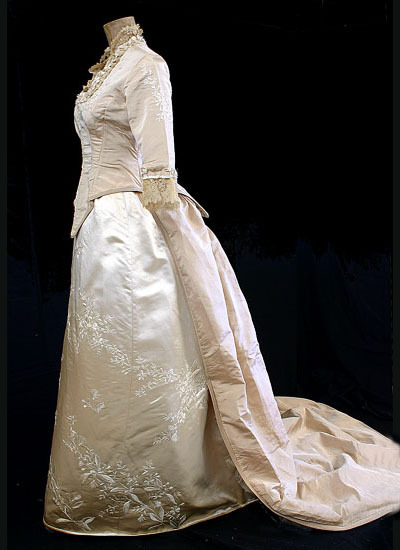 As antique gowns are generally very small and most likely in past perfect condition, you are probably better off having a gown custom-made. If you’re going that route, gather photos of your favorite dresses and highlight what features that you love the most. Talk with your dressmaker about your vision and make sure that you receive sketches of gown designs. 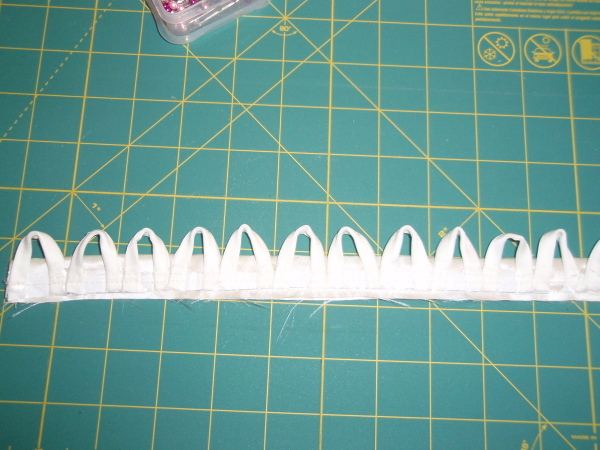 Ensure that you discuss materials and fabrics and that you see samples and swatches. 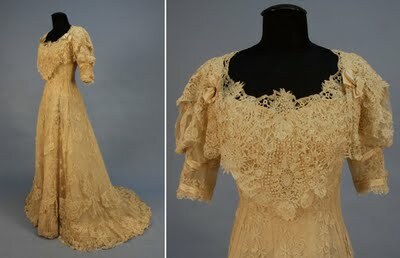 It can be difficult these days to find lace of the quality used in Edwardian gowns, so it may take your dressmaker some time to locate. 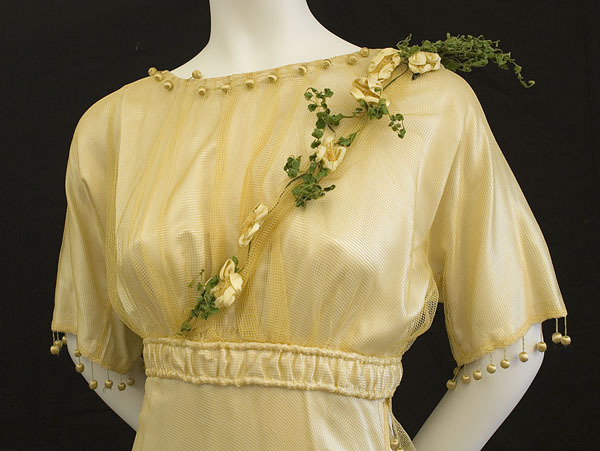 If you want to mirror Edwardian gowns, be prepared to pay more as most Edwardian era gowns are fashioned of silk fabrics. 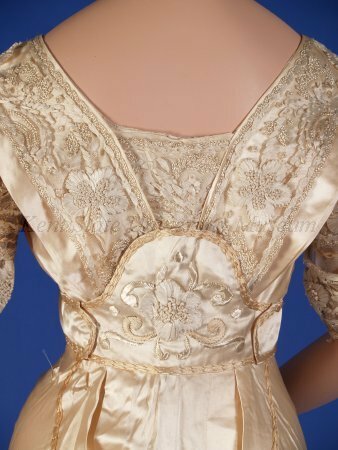 Synthetic fabrics can be used for cost-effective alternatives, but will not have the same luxuriousness and opulence of an Edwardian gown. If you’re wondering about the best way to find a dressmaker for your custom gown, start by doing online searches and asking at local fabric stores or a local alterations shop. 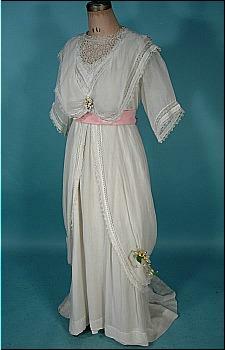 An Edwardian gown can be more tedious, so ensure that your dressmaker is capable of creating such a gown. 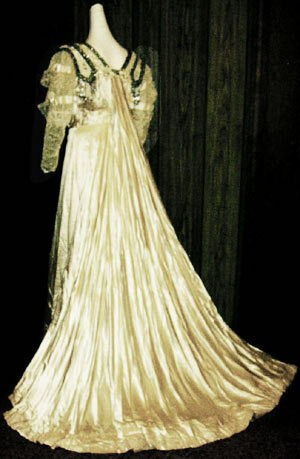 And as always, I am available to create the vintage gown of your dreams! Visit my website – tanyamaile.com (launching at the end of February 2012) or email me: tanya@tanyamaile.com. I absolutely LOVE the bridesmaids gown. This collection is superb. 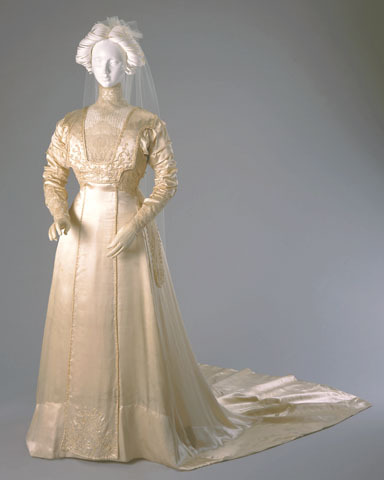 Nice collection from this fabulous fashion era…my wedding and the custom gown I designed and made for it were Edwardian. 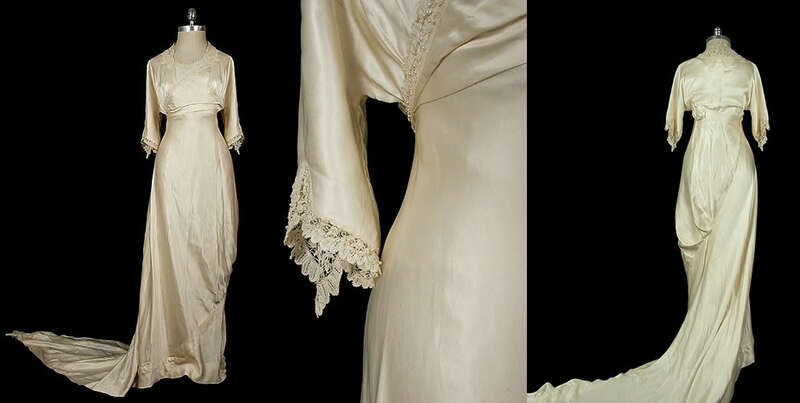 It did indeed take me a long time to find suitable fabrics and laces, but the gown was made entirely of Chinese and Italian silk, which did make the difference in the way the gown presented itself, which is key to Edwardian fashion. Understated opulence is vital, but can be so hard to recreate now days because quality and craftsmanship are not something you can go out and purchase retail very easily these days. Even finding the materials to create a quality gown was difficult for me, let alone the time it took to design and make the gown. However, I was able to purchase all materials for the gown for $300. 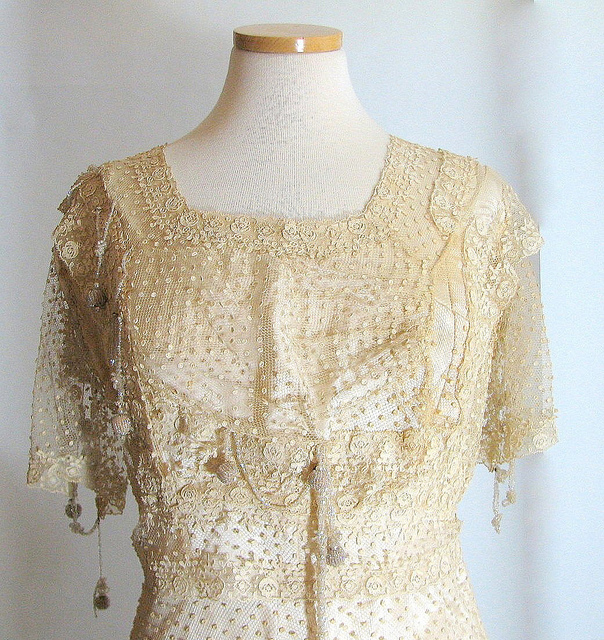 Usually materials can be found but are not what ends up costing for Edwardian fashion. As Tanya notes, it’s the complexity, detail, and difficulty of such gowns that end up making them cost so much to reproduce since a bride is paying mostly for the labor and skill of the dressmaker in being able to create vintage without having the dress end up looking like a theatrical costume (vintage dresses must work in a modern setting or they do end up looking like a costume). 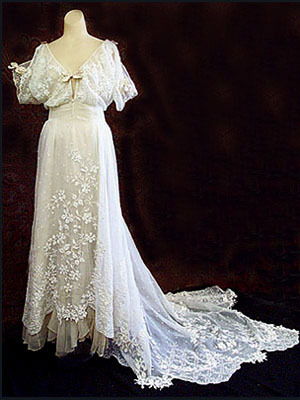 My custom Edwardian gowns (and that’s the only era I design for) usually cost anywhere from $2,400 to $3,000 just in labor costs. When you add the cost of materials most gowns end up going for $3,000 to $4,000. But, when you consider that brides who are going to upscale salons, i.e. 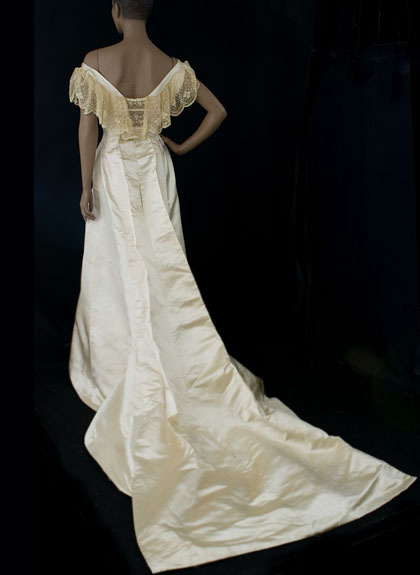 Kleinfelds in New York and paying $3,000 on the LOW END for non custom gowns often made out of polyester and synthetic fabrics, it’s a steal, in my opinion, to have a dress custom designed for you from an era that you are in love with and that are made from quality materials that will stand the test of time. I think many of these upscale designers have got a lot of nerve to charge brides from $5,000 to $15,000 for some of the stuff they create. They’re mostly paying for the designer’s name and not for the beauty, custom design, or quality of the dress. If you’ve got a decent budget for a dress of between $3,000 to $5,000 for a dress, do yourself a favor and have it custom made! Hi! 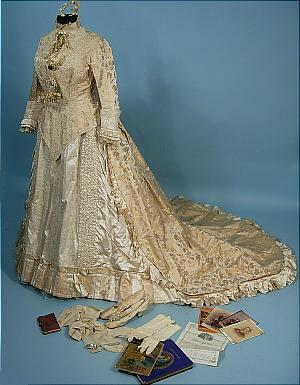 I am trying to get good ideas for shoes to match my very late Edwardian style wedding dress. It is a soft pinkish pearl and all my shoes are black, any ideas of shoes styles for a wedding dress that is not white and trying to stay before 1920 style?